If you want to make a difference in the lives of others, an online human development and family studies degree could help you find a rewarding career helping children, families, or individuals. Numerous factors, including people living longer and the opioid epidemic, have increased the need for community and social service workers. In fact, the Bureau of Labor Statistics projects a growth of 16% by 2026 in the social services industry, making it a great time to pursue a degree in human and family development. When you earn a bachelor's degree in human development and family studies online, you can expect to gain a unique set of skills, such as observation techniques and how to work with diverse groups of people. In addition to requiring general education courses, like English and math, programs consist of multidisciplinary core classes that examine the biology, psychology, and sociology of human development from infancy through adulthood. Covered topics include adolescence, marriage, family relationships, and human sexuality. Most online bachelor's in human development programs will also train you in research methods and require an internship or field practice to give you a chance to gain practical experience. Programs for earning a degree in human and family studies online will generally offer either a Bachelor's of Arts or a Bachelor's of Science degree. BA degrees have a broader liberal arts focus and often require more writing courses, preparing you for careers where strong communication skills are important. BS degrees put more emphasis on analytical and mathematical skills, ideal for those interested in research or business-oriented positions. Many programs allow you to tailor the degrees to your interests with specialized concentrations, such as early childhood development, leadership and entrepreneurialism, or prevention and intervention sciences. University of Alabama ranks #1 on The 15 Best Online Bachelor's in Human & Family Development Programs! The first public university in the state, the University of Alabama provides 40,000 students with an educational foundation for a lifetime of achievement. The university's Bama by Distance program offers remote access to numerous online degrees, including an online human development and family studies degree with two concentration options: child life specialists and child development practitioners. Both tracks require the completion of 120 credits to graduate. The child development practitioner concentration focuses on the stages of growth in childhood. This track familiarizes students with techniques that promote healthy and safe learning environments that foster collaboration among families and communities. Many students entering the child development practitioner program possess an associate degree and may apply up to 60 credits toward their BS degree. The child life specialist concentration incorporates numerous experiential learning opportunities into its curriculum, and graduates are eligible for the Child Life Professional Certification Examination. With an emphasis on healthy and hospitalized child development, this track includes topics in creative experiences for young children, bereavement, and medical terminology. Relocation to meet internship requirements may be necessary. The University of Alabama is regionally accredited by the Southern Association of Colleges and Schools Commission on Colleges. Pennsylvania State University-World Campus ranks #2 on The 15 Best Online Bachelor's in Human & Family Development Programs! With approximately 100,000 students in attendance across its 24 campuses, Pennsylvania State University provides unprecedented access to higher education. The school's World Campus features over 150 degree and certificate programs including an online bachelor's in family studies. This 120-credit program prepares graduates for careers at preschools, youth organizations, and elder care centers. The curriculum covers developmental milestones encountered across a lifetime, and students complete 27 required courses in family development, human services program administration, and helping relationship theories and research. The program offers a myriad of elective courses, including infant development, advanced child development, and the transition to adulthood. The program also encourages the formation of a human development professional identity, and students learn about the history of the profession, major trends in the field, and professional ethics and advocacy. In addition to completing online courses, students meet several fieldwork requirements, including an advanced internship experience and the completion of an internship project or research paper that totals 14 credits. Students satisfy required field hours at a human services agency in their hometown. Potential internship sites range from day care centers and schools to mental health agencies and nonprofit organizations. Oregon State University ranks #3 on The 15 Best Online Bachelor's in Human & Family Development Programs! Located in Corvallis, Oregon, Oregon State University's Ecampus offers asynchronous courses that allow students to earn a degree without interfering with family life and work obligations. Delivered by experienced faculty in conjunction with instructional designers, Oregon State University's online programs, such as the online bachelor's in human development, rely on innovative technology to create engaging virtual classrooms. Comprised of 180 quarter credits, the online human development and family sciences BS emphasizes skills in writing, critical thinking, and problem solving that meet the needs of individuals and families at all stages of life. Topics in the curriculum include family violence and neglect, human nutrition, and parenting research. Students acquire skills for career entry positions in the human services industry, and many continue their education at the graduate level in areas like counseling and social work. The flexible Ecampus format allows students enrolled in this program to minor in public health or sociology. Transfer students must complete at least 45 of their final credits through Oregon State University. In addition to program accreditation by the Council on Education for Public Health, Oregon State University is regionally accredited by the Northwest Commission on Colleges and Universities. Washington State University ranks #4 on The 15 Best Online Bachelor's in Human & Family Development Programs! With more than 600 study abroad programs and 23 degrees available online, Washington State University connects students around the world to career-focused, academic programs. The university's Global Campus offers an undergraduate degree in human development and family studies online. The program includes two certification options in gerontology or early childhood education that students earn concurrently with their degree. Online learners with interests in gerontology may acquire certification for careers working with the elderly. Washington residents are eligible for an early childhood certification that leads to careers in childcare, protective services, and crisis center settings. In addition to completing Washington State University's core requirements, students enrolled in the online human development program complete 11 credits of introductory courses. Topics include lifespan development, family systems, and human development theories. Students complete 12 credits of upper division courses that offer in-depth studies of various stages of growth and family issues, including coping with stress and parenting styles. The program features a selection of integrative courses that examine contemporary family issues like poverty, work balance, and social policies. The program's culminating experience requires students to complete 4-8 credits of fieldwork. Major coursework for this program consists of 42 credits, 21 of which students may transfer from a previous program. Colorado State University - Fort Collins ranks #5 on The 15 Best Online Bachelor's in Human & Family Development Programs! Colorado State University provides an accessible education to individuals pursuing professional opportunities that promote upward mobility and economic growth. While the university attracts more Colorado high school graduates than any other college in the state, participation in its inclusive academic programs is not limited by geography. The university's online program delivery allows domestic and international students to earn their online human development and family studies degree from the comfort of their home. Colorado State University-Fort Collins' human development and family studies offers a flexible curriculum that suits the lifestyles of busy working professionals. This 120-credit degree requires students to complete 42 upper division courses in areas like risk and resilience, couples studies, and intervention strategies across a lifespan. Students engage in training for professional advocacy and the facilitation of community empowerment with diverse groups of people. Students select one of five concentrations: early childhood professions, leadership and entrepreneurial professions, pre-health professions, prevention and intervention sciences, and human development and family studies. Graduates of this program pursue careers in social service environments, corrections, and long-term care facilities. Colorado State University is regionally accredited by the Higher Learning Commission. University of Wisconsin - Stout ranks #6 on The 15 Best Online Bachelor's in Human & Family Development Programs! In 1911, the University of Wisconsin-Stout assimilated into the University of Wisconsin System. Today, the polytechnic school provides students with an integrated academic experience that includes elements of liberal arts education and vocational training in an experiential learning environment. Featuring one of the top online human and family development programs offered in this type of setting, students in the human development and family studies degree learn about careers in afterschool programs, disability service agencies, and research facilities. The online degree-completion program consists of 120 credits, including 43 general education requirements that transfer from an associate degree. Major coursework in areas including individual and family interventions, family research, and sexuality across the lifespan comprise roughly half of the degree, which students complete in two years of full-time study; students can also take the program part-time. Students develop their own concentration by completing 15 credits in a specific area or by combining complementary disciplines; they also complete an internship near the end of the program. Graduates of this degree qualify for certification as a family life educator through the National Council on Family Relations. The University of Wisconsin is regionally accredited by the Higher Learning Commission. University of Arizona ranks #7 on The 15 Best Online Bachelor's in Human & Family Development Programs! The University of Arizona's more than 40,000 students take advantage of its many academic programs. The school's online bachelor's in family studies features a per-credit tuition rate that enables students to earn their degree while avoiding out-of-state tuition costs. Using asynchronous course formats, instructors create engaging online classroom content that students access at their own convenience. Ideal for individuals seeking careers working closely with children and families, this degree equips students with the tools needed for positions in social policy development, law enforcement, community health, and counseling. The curriculum prepares students for a graduate program in the social sciences. Completed in four years, students begin as pre-majors engaging in a foundational curriculum with corresponding general studies coursework. A student's first semester in the program may include English and math courses along with introductory human development coursework. Once students satisfy pre-major requirements, they apply for the family studies and human development major and begin upper-division coursework. Major courses include topics in family studies leadership and ethics, advanced family relations, and cultural influences on development. Students with a preference for an internship select an organization in the Tucson area. The University of Arizona is regionally accredited by Higher Learning Commission. North Dakota State University ranks #8 on The 15 Best Online Bachelor's in Human & Family Development Programs! Located in Fargo, North Dakota State University employs and enrolls diverse populations with unique cultural and regional backgrounds. Strengthened by these attributes, the school's distance and continuing education program offers a variety of accessible degrees, including a human development and family studies program online with three concentration options. Concentrations in child and adolescent development, family science, or adult development and aging provide students with training for careers working with distinct populations. The child and adolescent development track prepares students for positions providing direct and support services. Students complete nine credits focused on infant, child, and adolescent development with a focus on cognitive, emotional, and physical areas of growth. The family science track examines relationship issues, family finance, and methods for reducing family stress with an emphasis on family life education. The third track, adult development and aging, explores the factors that influence adult aging such as gender and family dynamics. Students enrolled in the BS in human development and family science program complete 20 core credits that familiarize them with family science, theories and stages of lifespan development, and public policies affecting families. Students acquire skills in cultural competency by completing a five-credit field experience at their home location. The program requires 122 credits to complete a minor in an area of the learner's choosing. North Dakota State University is regionally accredited by the Higher Learning Commission. Brigham Young University - Idaho ranks #9 on The 15 Best Online Bachelor's in Human & Family Development Programs! Brigham Young University's academic programs embody the vision of its early founders by producing capable leaders affiliated with The Church of Jesus Christ of Latter-day Saints. The university serves more than 33,000 online learners and features 12 online undergraduate degrees and 300 online courses. The university's online human development and family studies degree offers a holistically-focused curriculum that unites theories of family relations with the teachings of Jesus Christ. The program's fully online coursework prepares students for managerial positions in victim support services, family resource centers, and nursing homes. The 120-credit degree consists of 40 foundation credits, 54 major credits, and 26 elective credits. In addition to familiarizing students with a variety of academic disciplines, Brigham Young University's foundation courses include 14 credits of eternal truths, which focus on the doctrine of the Book of Mormon, scripture studies, and the principles of eternal marriage. The marriage and family studies major emphasizes the acquisition of skills that promote healthy marriages and family relationships. Students acquire knowledge of parenting practices, money management, and theories of family dynamics. The program requires the completion of a family practicum and internship, and distance learners who choose to complete an online internship at an approved site in their area. Brigham Young University is regionally accredited by the Northwest Commission on Colleges and Universities. Hope International University ranks #10 on The 15 Best Online Bachelor's in Human & Family Development Programs! Located in Fullerton, California, Hope International University offers a Christ-centered education grounded in the Restoration Movement. The university supports student faith through the examination of contemporary methods of stewardship. The school's online bachelor's in human development provides students with the training necessary to nurture their faith and community simultaneously. Constituting 120 credits, students complete 46 major credits, 49 leadership and ethics core credits, and 25 electives. The leadership and ethics core serves as the university's general studies requirement, and students complete liberal arts coursework in addition to a course that explores modern Christian perspectives. The BS in human development features two concentrations: the community mental health and counseling concentration or the family studies concentration. The mental health track emphasizes training in therapeutic interventions and case management. Example courses include abnormal psychology, counseling skills, and counseling theories. The family studies track familiarizes students with theories of child and adolescent development, and students complete coursework in areas like the sociology of families, parent-child relations, and toddler mental health. Students of both concentrations complete a capstone course in which they develop a case project that includes thoughtfully selected components of theories, techniques, and biblical values to create a comprehensive treatment plan. Hope International University is regionally accredited by the Western Association of Schools and Colleges Senior College and University Commission. Utah State University ranks among The 15 Best Online Bachelor's in Human & Family Development Programs! With a distance education student population of nearly 15,000 and more than 30 online degrees, Utah State University provides an accessible education that promotes public service. Not only does the school's online format provide a flexible option for working professions with families, it also offers online students access to online tutoring, testing services, and discounted software programs. Available with an emphasis in human development or family relations, this online bachelor's in family studies features a 120-credit curriculum that takes full-time students four years to complete. Prior to beginning core coursework, students complete a series of courses that provide introductory knowledge in human growth across the lifespan, professional development, and statistics. The major core includes 25 credits of courses that prepare students for service-oriented occupations working with children, families, and elderly populations. Students complete upper-level coursework in human sexuality, parenting and child guidance, and family finance. The program offers several elective courses, such as balancing work and family, that allow students to focus on areas that correspond to their career interests. A final senior project requires students to develop a portfolio that documents their professional growth throughout the program. 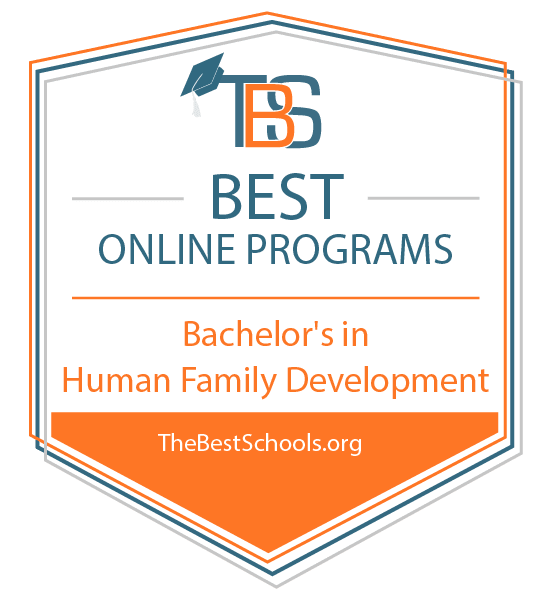 Amridge University ranks among The 15 Best Online Bachelor's in Human & Family Development Programs! Established in 1967 in Alabama's capital city, Amridge University is a private Christian college specializing in distance learning. The university offers more than 30 online degrees that encourage growth in leadership and spirituality. Students gain skills needed to lead successful careers while serving their church and community. More than 90% of the school's graduates surveyed during 2016 reported being employed, with the vast majority landing positions in their field of study. Amridge University features one of the leading military friendly online human and family development programs available in the country. Veterans and active duty military personnel and their spouses pursue their degree at discounted rates through the assistance of the Post-9/11 GI Bill, Montgomery GI Bill, and the Yellow Ribbon Scholarship Program. Additionally, the university offers a variety of scholarships to new and returning students. Students enrolled in this human development bachelor's program complete 128 credits, including 40 general studies courses, 40 major courses, and 48 elective credits. Major courses include topics in child development, counseling theories, and theories of personality. The university encourages the completion of electives in systematic theology and New and Old Testament studies in addition to human development courses. Graduates of this program often pursue their master's in family therapy or counseling-- available through the university's graduate school. Amridge University is regionally accredited by the Commission on Colleges of the Southern Association of Colleges and Schools. San Diego Christian College ranks among The 15 Best Online Bachelor's in Human & Family Development Programs! Located in Santee, California, San Diego Christian College offers biblically-focused academic programs that emphasize culturally relevant perspectives. The university's online bachelor's in human development allows students to earn their degree online, on-campus, or in a hybrid format. Graduates of this program pursue careers with human resource agencies, early childhood centers, and youth organizations. The 123-credit human development BA takes full-time students approximately four years to complete. With an emphasis on interpersonal skills, the major curriculum familiarizes students with topics pertinent to careers in the social service industry. Through a combination of courses in lifespan development, motivation and learning, and counseling theory, students gain an appreciation for the complexities of human psychology. The program's general education requirements expose students to courses in biblical studies and Christian ministries. San Diego Christian College requires applicants to provide evidence of their dedication to the Christian faith through the documentation of community service and involvement in a church. Prospective students submit a recommendation from a church leader familiar with their spiritual journey. Applicants possess a minimum ACT score of 19 or SAT score of 1350. Students who do not meet these requirements may be required to submit an academic recommendation. San Diego Christian College is regionally accredited by the Western Association of Schools and Colleges. California State University, East Bay ranks among The 15 Best Online Bachelor's in Human & Family Development Programs! The online bachelor's in human development completion program at California State University-East Bay prepares students for graduate programs in social science fields like anthropology, counseling, and social work. The program offers more than 400 majors, and many students select this program for its flexible online format. The online format employs the latest technology to deliver course materials, and students engage in an interactive virtual environment that features blogs and video streaming. The program selects 60 transfer students for the fall semester. Consisting of 180 units, students take foundational courses in human or child development, psychology, and ethnic studies. Upper-level courses focus on theories of human development, research methods, and contemporary perspectives of the field. Students examine cultural and social factors impacting cognitive, emotional, and physical growth. During the final year of the program, students select a concentration in one of the following developmental areas: early childhood, adult and gerontology, or women's development. Students take five courses in their chosen concentration. The program concludes with two senior projects that require students to select a research area and develop and execute a project. California State University is regionally accredited by the Western Association of Schools and Colleges. Stephen F Austin State University ranks among The 15 Best Online Bachelor's in Human & Family Development Programs! Located in Nacogdoches, Texas, Stephen F. Austin State University offers residents of eastern Texas and distance learners around the world a student-focused academic experience. The school's BS in human sciences features an emphasis in human development and family studies for students seeking careers working with children. The online curriculum explores major areas of growth and change that occur across the human lifespan, and students acquire knowledge of how to help families with parenting challenges, consumer problems, and intergenerational issues. Prior to completing fieldwork requirements, students participate in a pre-practicum course focused on professional development, ethics, and interdisciplinary collaboration. In-depth examinations of child development and family interactions prepare students for a culminating internship experience where students practice what they have learned. Eligible applicants possess two years of completed coursework prior to entrance into this degree-completion program. Students apply up to 66 credits toward their degree and boast a GPA of 2.0 or better. The school offers human science transfer students access to a course equivalency guide and a two-year planning guide. Students must complete a minimum of 36 upper-level credits at Stephen F. Austin State University. The program accepts applications throughout the year. Stephen F. Austin State University is regionally accredited by the Southern Association of Colleges and Schools. Whether you earn a BA or BS degree, obtaining a bachelor's degree in human development and family studies online will open up a variety of career choices that allow you to interact with people on very personal levels. Health Educator: Health educators act as a liaison between communities and healthcare providers. They create and implement outreach programs meant to improve the health and welfare of communities through knowledge and prevention strategies. They collect data, prepare reports, and facilitate access to healthcare for community members who often come from underserved neighborhoods. Human Resource Specialist: Human resource specialists interview and evaluate candidates for employment, recruiting new hires, navigating sensitive work situations, and addressing employee concerns and needs. HR specialists must be knowledgeable of federal, state, and local regulations and have the potential to advance to Human Resource Director with additional graduate-level education. Social and Community Service Manager: Social and community service managers work with a wide-range of people from homeless veterans to drug addicts to children and the elderly. They collect and analyze data to determine the effectiveness of outreach programs. Strong writing and public speaking skills help with preparing grant proposals and communicating with the public. Many begin their careers as social workers or drug counselors and move into a management role after acquiring a master's degree in public health or a related field.